In view of monsoon season, SDKS sanstha has started its Annual plantation programme. This programme was organised on 7th july in the park behind NKJ Apartments, sector 23, Dwarka. Sh. 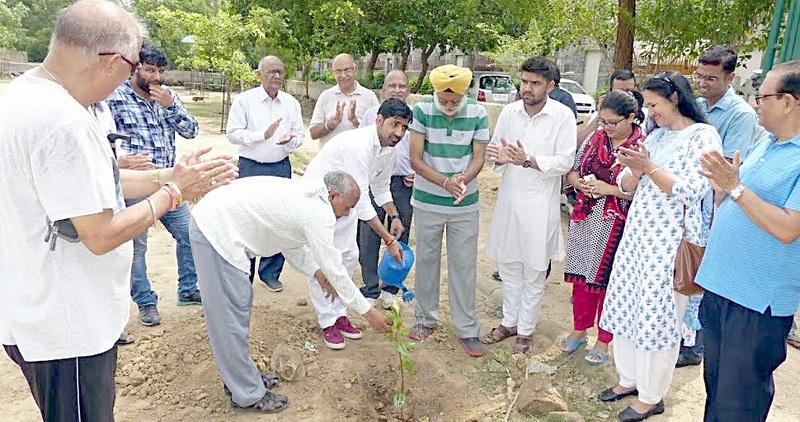 Ramesh Matiyala (Councilor) and around 30 residents participated in the plantation drive. Sh PB Mishra , Gen Secretary of SDKS gave a brief account of the history of plantation drives, which were carried out by the Sanstha. In the past, Sanstha has been commencing the annual plantation drive from 5’th June, which ends in September. Capt Mann welcomed the chief guest, Sh. Ramesh Matiyala and hoped that MCD shall provide the necessary assistance in the Future Plantation Drives. The horticulture staff was appreciated for their assistance in making the plantation drive a success. Sh. CL Paul , President of NKJ Apartments also spoke on the occasion and praised the good work done by Sanstha and the Horticulture Department of MCD. In the end Sh. Sh. Ramesh Matiyala thanked the Sanstha for making him a part of the plantation drive. He praised the good work done by Sanstha and assured of all possible assistance in the coming future. The councilor also promised to improve the sanitation scenario of the area by segregation of garbage. Light refreshments were served in the end of the programme.